A while ago, I posted about my love of Flamingos. In case you missed it you can read it by clicking here! So, it is safe to say that I have been into Flamingos for a while and they have slowly been popping up! Today I found this coat worn by someone during Paris Fashion Week and just had to share! It made me think about what attracts someone to a specific item of clothing and while sometimes it can be the brand, or the cut; most of the time it's because it probably just speaks to them. 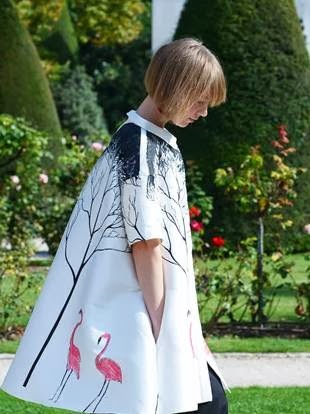 This coat, while very lovely does not particularly reflect my own personal style, but I was drawn to it because of my love of flamingos. Therefore it spoke to me, not in a "you must go out and have it" kind of way, but more like an "aw, that's a pretty awesome coat" kind of way. Sometimes it is just fun to admire someone else wearing something interesting!